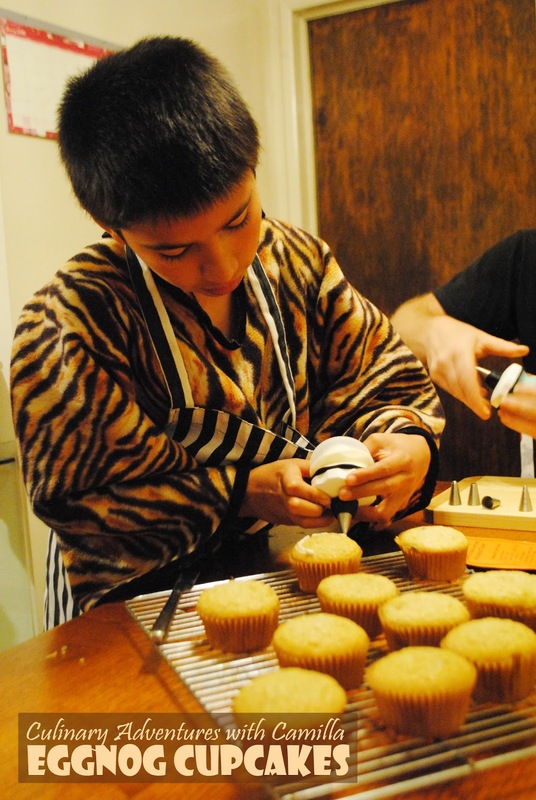 Cupcake Day is the brain-child of Coleen of The Redheaded Baker. When she suggested it, I was in immediately. 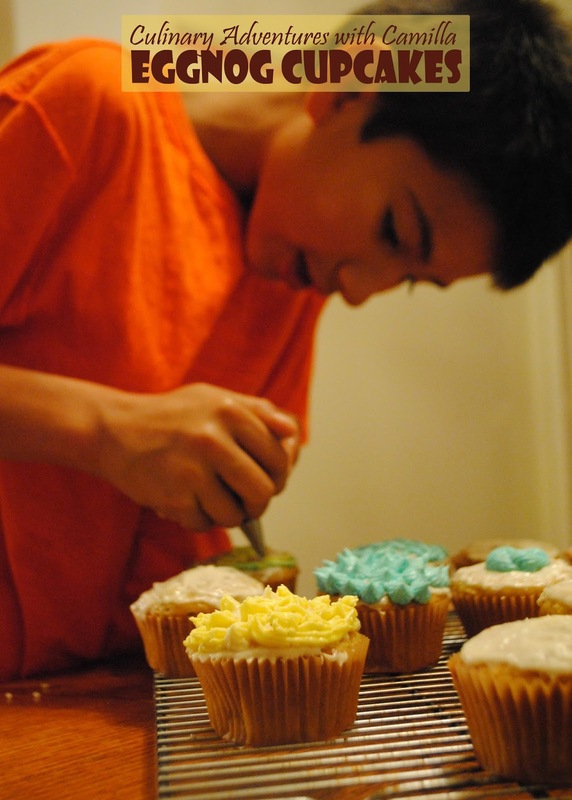 I'm always looking for cupcake recipes for school birthday treats; I figured this was a way to get some new-to-me recipes. Besides, I wanted to use the 8-Piece Baker's Silicone Decorating Bottle Kit from OXO that they sent as a thank you to all #FBCookieSwap participants. Well, truth be told, my Enthusiastic Kitchen Elf wanted to use it. In fact, the day I received the box from OXO, he immediately stuck the kit in with his baking items. "Hello...was that your name on the box?" Well, two of my boys had a great time decorating. The third wasn't feeling too hot, so he went to bed early. Boo. The other two Baker Manns did save a yellow one for R. He'll be happy. 'Tis the season for eggnog. 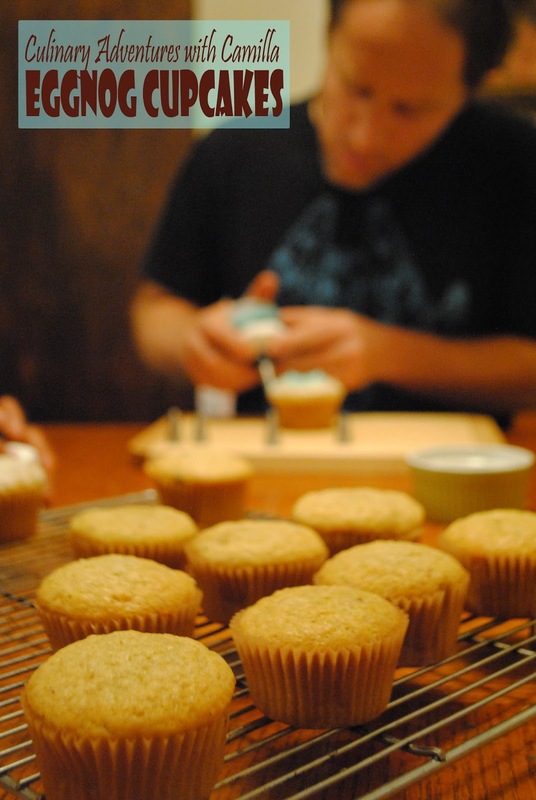 I knew I had to make eggnog cupcakes. They have a delicate crumb and a delicious spiciness. 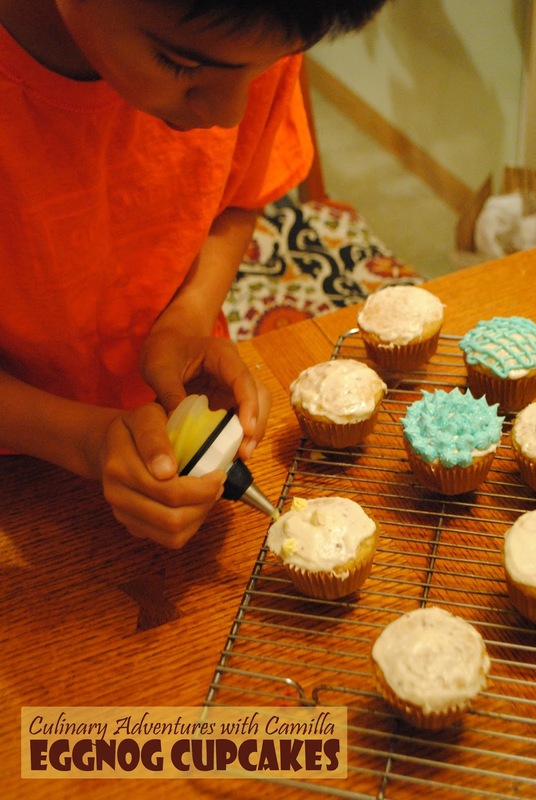 This recipe makes a dozen cupcakes but the frosting only covered about 8 of them. They are fine without the frosting, too. Does that make them a muffin?!? 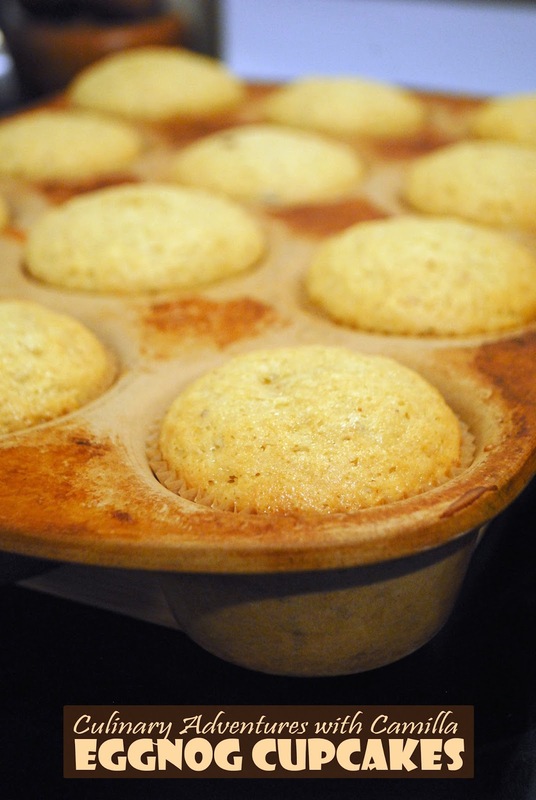 Preheat the oven to 350˚ F. Line cupcake hollows with parchment liners. 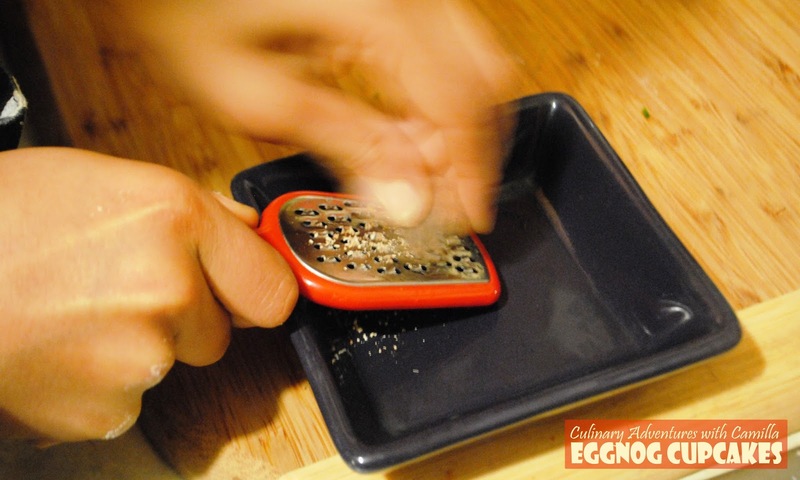 In a medium bowl, combine the flour, baking soda, nutmeg and whisk to combine. In another bowl, combine the eggnog, olive oil, vinegar, and sugar. Beat on medium-low speed until well blended. 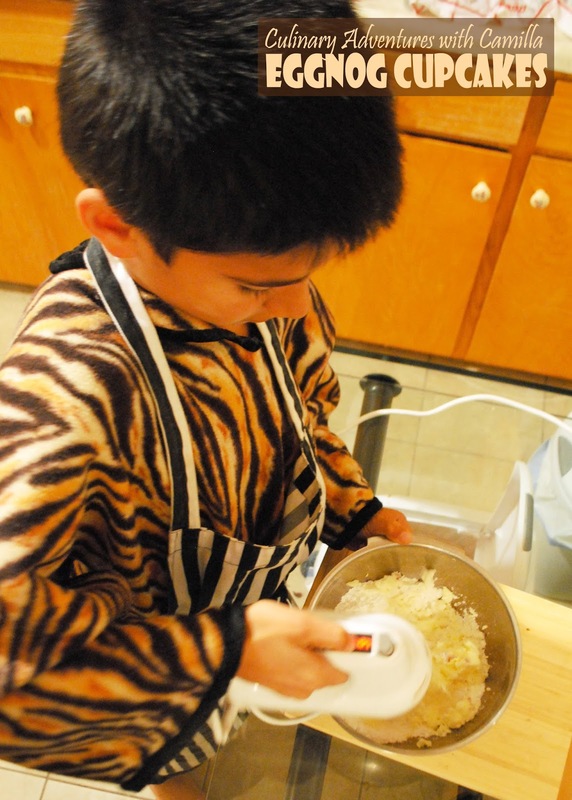 Stir in the dry ingredients and fold in until just combined. 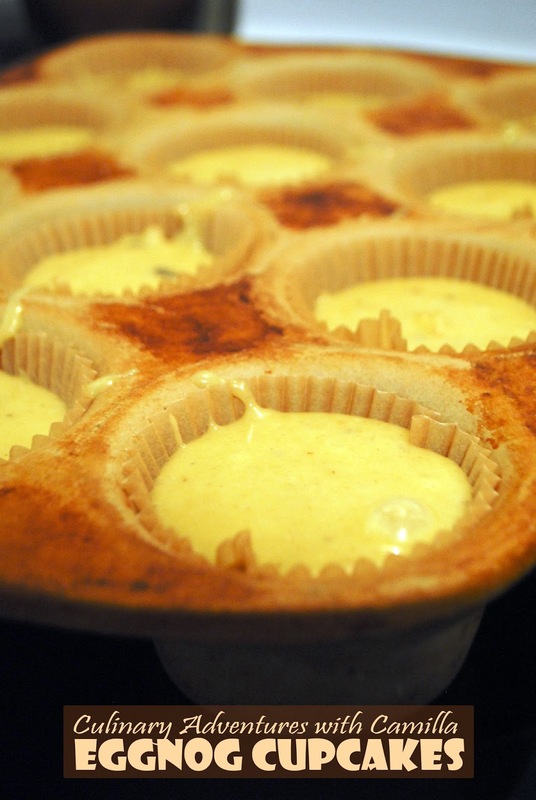 Spoon 1/2 C of batter into cupcake liners, filling the hollows about 2/3 full. Bake 25-30 minutes, or until a toothpick inserted in the center comes out clean. Allow to cool in the pan 5 minutes, then transfer to a wire rack to cool completely. 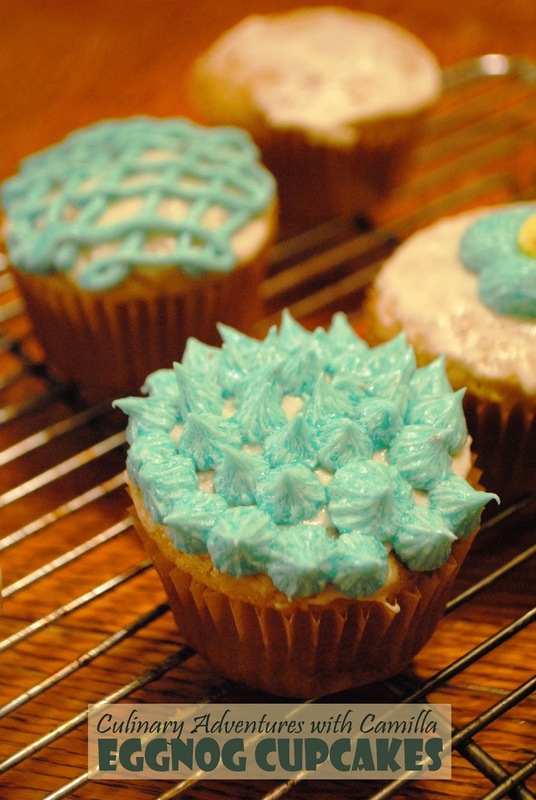 While they cool, prepare your frosting. Place the butter in a mixing bowl. Beat until smooth, 20-30 seconds. Add in the powdered sugar, salt and nutmeg; beat on until incorporated and smooth, about 1 minute. Scrape down the sides of the bowl. Add in the eggnog and vanilla; whip until light and fluffy, maybe 3 minutes. Add food coloring if you like; D kept one natural and made two small batches of color - one yellow and one blue. 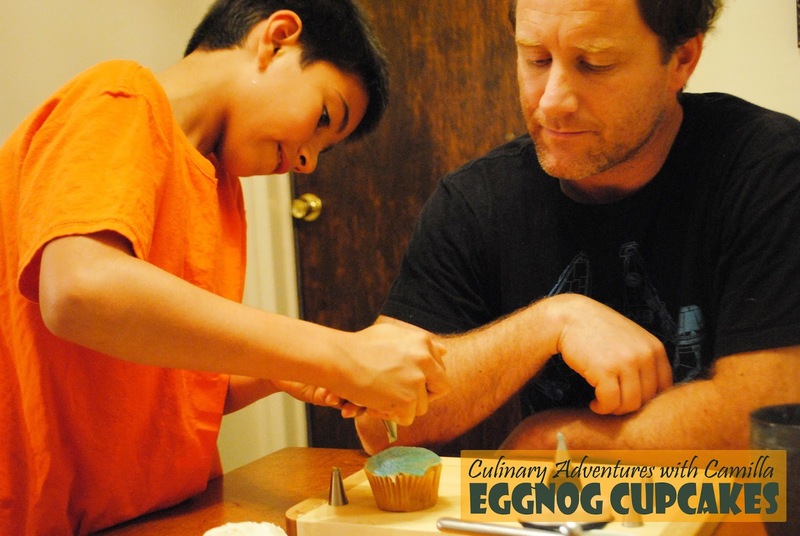 ben loves eggnog so i should totally make these for him. i love all the spices in these cupcakes! Thanks, Sarah. Yes, we are a little spice-mad in our house, but it tastes so fabulous. Very nice and wonderful Holiday memories. Hope your 3rd boy is feeling better now. Yes, he is! Back to school today. I hear him whistling now! He did. They both did! Nice! Let me know if you try it. You all look like you had fun making those cupcakes. I really need to get some eggnog now! We surely did. I need some more eggnog, too. Thanks. Yes, it was fun! How cute (the cupcakes and the cupcake decorator)!! Happy cupcake day! 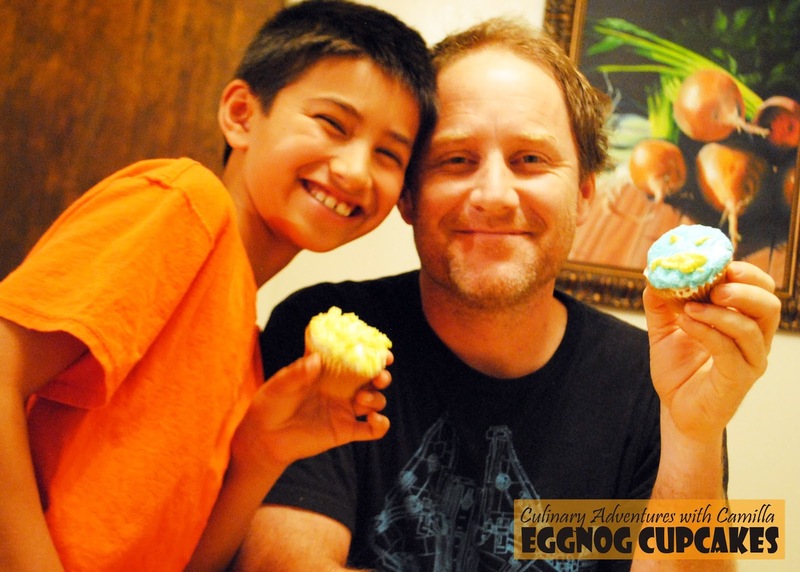 Eggnog cupcakes sound so good! 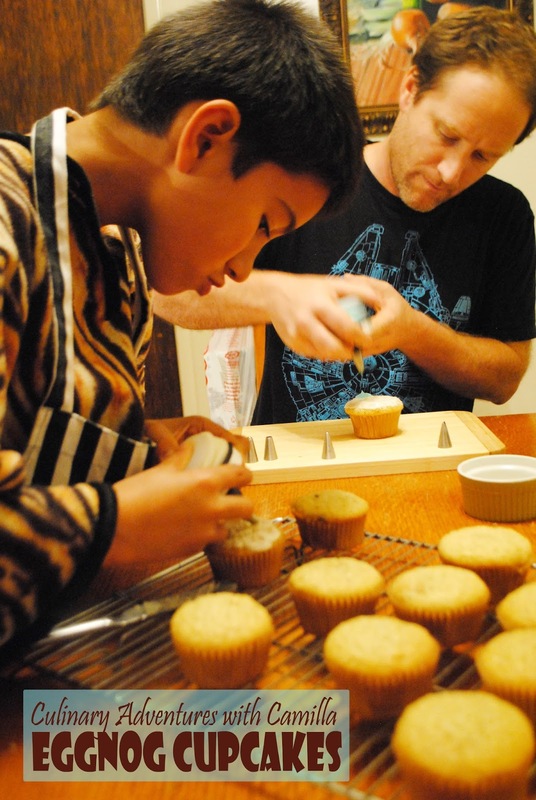 Love that you got the whole fam involved in your cupcake baking. Hope you all had fun! I know! 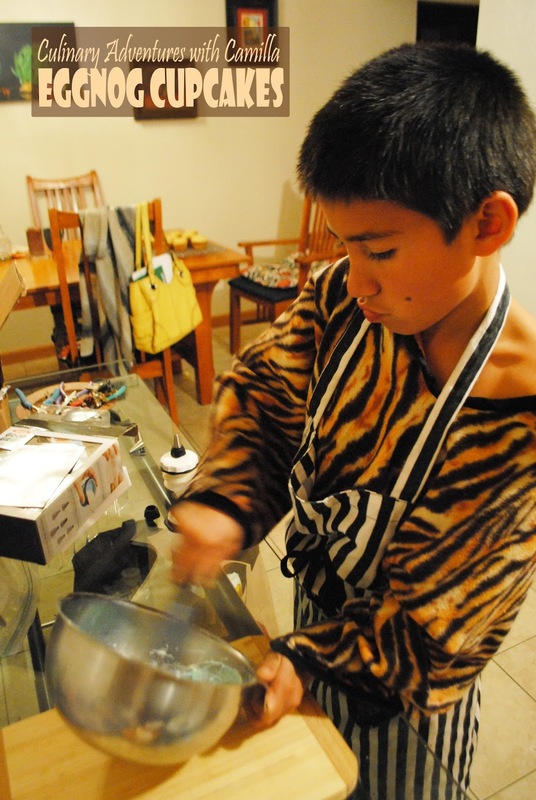 It's so much fun to have kitchen elves! But I know what you mean: it goes by too quickly.